[1.0.0.7] BWC Sorcerer - Fire walk with me! This is straight up BWC spamming caster build guide, noting new, noting funny but since lately there is much talk about how casters are underdeveloped and they need more this and that, build you are about to see can compete and in some cases outperform top melee builds. Finish all main game content and Im 100% sure gladiator crucible also but I didnt tested it. Facetank and kill all nemesis really fast, Mad queen is not facetankable it requires some really small amount of kiting but you can drop her in ~30 sec. You can try with facetanking and do it in some cases but you will risk dying and improvement in kill time is like ~3 secs so its not worth it imho. For this occasion I prepared two gear vise setups for this build, one less gear dependent and one more gear dependent. * Pictures are only with constant auras. Dont get confused with low sheet dps, for some reason game is probably not calculating burn dmg in sheet dps and burn is your main source of dmg. Burn dots on this build are going up to 50k dmg. NOTE: Everything from now on will be related to less gear dependent setup of the build. Like with gear I will propose two devotion setups for this build, one that is more offensive and abuses termite mines/meteor shower combo and other one more defensive with ToL for absolutely no energy or what ever issues. Note that all pictures above and everything written is related to defensive setup of the build, cuz I find it more smooth to play, much more tanky and more forgiving and you don't lose much of your clear speed or single target dmg power. 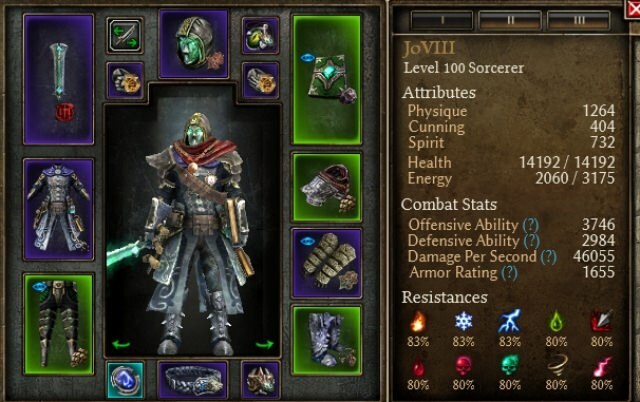 What makes this build tanky? 1. Mirror + blast shield combo. With high enough CDR you can almost cast it back to back. Mad Queen kill sequence goes like this: Place termite mines (you can totally cc it with this but we are not abusing here ) trow flash bang at it and start spamming bwc, when MQ approaches and hits you, your blast shield will activate and give you 4 secs to spam bwc (make sure that you keep her under efect of flash bangs whole time, so use it every 4-5 secs, also dont forget to nullify when needed), when blast shield goes down as son as she hits you once use mirror that will give you 3 secs more to spam bwc. When mirror goes down use ToM and keep spamming bwc If you are lucky your blast shield will get out of CD and activate again (in this case she is 100% facetankable) if not she will proc your mark. With mark proc you have 3 more secs of invulnerability so just keep spamming bwc. When mark goes off your blast shield will be out of CD for sure so it will activate and you have 4 secs more to spam bwc. When blast shield goes down use mirror for 3 more secs of invulnerability and bwc spamming. If all your defenses are on CD kite a bit and repeat the sequence more carefully cuz now you dont have a mark proc. For even better results you can use sequence that opens with mirror cuz AV proc is reducing Mirors but not blast shield CD but that requires some practice. 2. Devotions if you are going defensive devotions route. 3. High DA, armor and armor absorption. 4. Nice dodge and deflect with searing light on 10/10 coupled with inate dodge and deflect from devotions and armor bonuses. I find energy management for this type of build to be of crucial importance if you run out of energy in middle of fight assuming that your EoS is on CD you will have to disengage and run around until EoS comes out of CD or you regenerate some energy. That kind of game play is unacceptable for me. Also If you have to constantly watch on your energy bar and time your EoS in order to sustain energy, it will draw your attention from actual game play and you will under perform. If you have no other way to play, that could be ok, but certainly I wouldn't consider that type of build to be high end build and this build is high end. So you can conclude from this that this build has no energy issues what so ever. 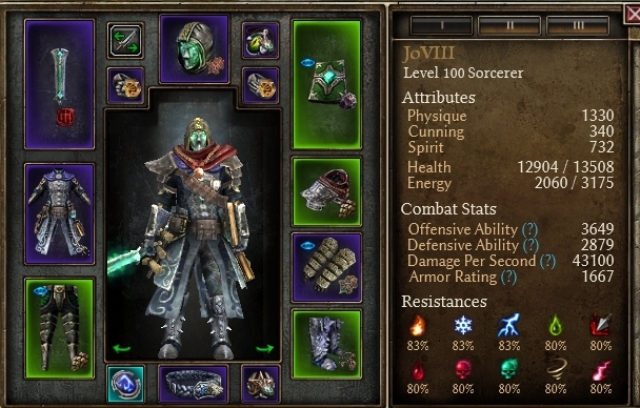 Avoiding energy issues is main reason to pick arcanist above some other class for this build. Having high spirit and +% spirit from Inerr focus will certainly increase your energy regeneration, IEE % to energy regeneration and AW flat energy regeneration is also nice, not to mention ToLs healing rain, but main thing that helps you manage your energy is Mental alacrity (-% to skill energy consumption). For this build -1% skill energy consumption is roughly equal to 4 energy regeneration per second. So having -14% from level 5 MA is equal to 56 energy per sec. I find lvl 5 MA to be enough to sustain enough energy, but if you need more energy invest few more pts in MA Optionally you can invest some more points in IEE or put ectoplasm in rings/medal (I even recommend that in process of leveling). To have more complete picture about energy managment I will just add that with this setup and lvl 5 MA you can spam BWC for 15 sec before you run out of energy (~45 bwc casts), and that is w/o ToLs healing rain proc or activated AW, just with innate 70 energy regen per sec. When ToL healing rain procs this build has 169 energy regen per sec (its up 8 secs with CD of 9.7 secs), and when on top of that AW activates it has 238 energy regen per sec. Is it worth mentioning 55% energy absorption from enemy spells? I really don't remember last time I used EoS to replenish energy. Like I said is pretty straightforward BWC setup, that abuses burn from bwc and procs to literally melt everything on its way. So gameplay comes to this: Just move forward spamming BWC and flashbangs all around you. You can but dont need to use termite mines unless facing some nemesis/boss and even than you are using it just to improve kill times noting more. This build is leveled long ago and was something else so it has 84 points in physique 5 in cunning and 1 in spirit. But you can go full physique w/o any issues. Last edited by JoV; 02-15-2017 at 08:08 PM. This build uses IK set and full set is bis imho. IK set is designed to support BWC build and full set bonus proc is valuable asset to have. Optionally you can change belt for ulzuins torment or something else if you dont have IK one. Wyrmbone hendguards are also BIS, with less gear dependent setup I used Hanguards of justice just because I couldn't cap pierce resistance w/o them. With all the talk about casters being underdeveloped I was really surprised by efficiency of this build. I do have PRM/Devastation and CT/Devastation sorcerer builds but this one is outperforming them by far especially now when devastation is nerfed. So imho IK BWC spamming setup is definitely meta when it comes to sorcerers builds and its one of the best if not the best caster setup available in GD. Since grim calc tends to mess up skill points distribution after each patch, here are the pictures of skill trees. Pictures are related to more gear dependent setup of the build. 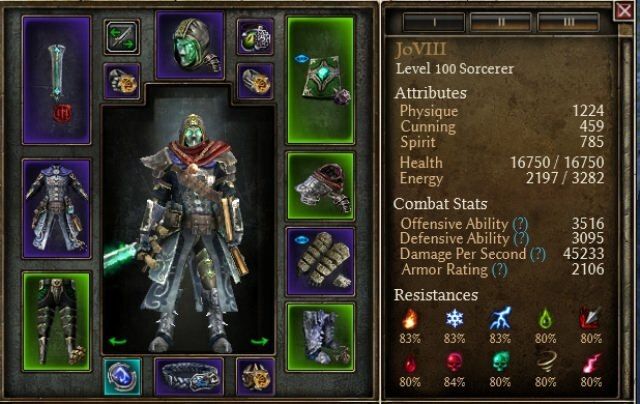 Since this update varies from original vanilla game, in terms that is much more challenging and requires more sturdy and overall tanky build to be successfully conquered, I picked up this build setup to be mine first char to play and farm AoM. Main reasons I did that is not just sturdiness/tankines this build is offering but also its versatility, or in other words you are not to some great extent gear dependent and gear is easy interchangeable and adjustable to things that you have. Ofc that doesn't mean you can finish the game, farm nemesis and gladiator cruci with some total trash gear, but you can do it reasonably well with as example pre AoM gear setup i posted earlier or something else that is on your disposal. As you can see Im missing fair chunk of new mythical gear and greens could be much better but this what I have is more than enough to survive anything this game can trow at you unless you decide to fight with Ravager one on one. Im really happy and satisfied with things that Crate developers did in AoM (kudos to you guys, keep up the good work), it gave new life to the game, great new content and breath taking items/classes that opened so many new build possibilities. Many new players joined community and some old, well known to all of us, are back (hello Jajaja ) and hopefully will stay with us for long. Changed some stuff and slightly polished build to be able to reliably farm cruci 150-170 w/o buffs and banners while keeping x10 multi. Last edited by JoV; 12-30-2017 at 07:31 PM. Oh JoV...I'm looking forward to this one! I don't know if it's just me but i always thought Aldanar's Vanity is a bit overrated. Do you really need it? Last edited by Chthon; 01-19-2017 at 01:55 PM. AV is perfect for this setup in all aspects, fire dmg, burn dmg, some OA and DA, energy regen, CD reduction, +1 to all skills and nice proc. I just couldn't find anything even comparable to it. Meh, i went with the Off-hand that has the skill called Unmake (can't remember the name, looks like the Death Note) to get more RR. I never found the CDR skill to be reliable. But yeah i agree about the plus skills part. Are those Incorruptible Gollus Rings of Attack? Last edited by Chthon; 01-19-2017 at 02:03 PM. CDR is key part to tankines of this build having almost back to back blast shield and mirror is priceless. Also with solaels flame, T mines, warpfire and innate rr from BWC line you have plenty of it. If it uses a shield I dont doubt. You dont have MP issues with commando setup?